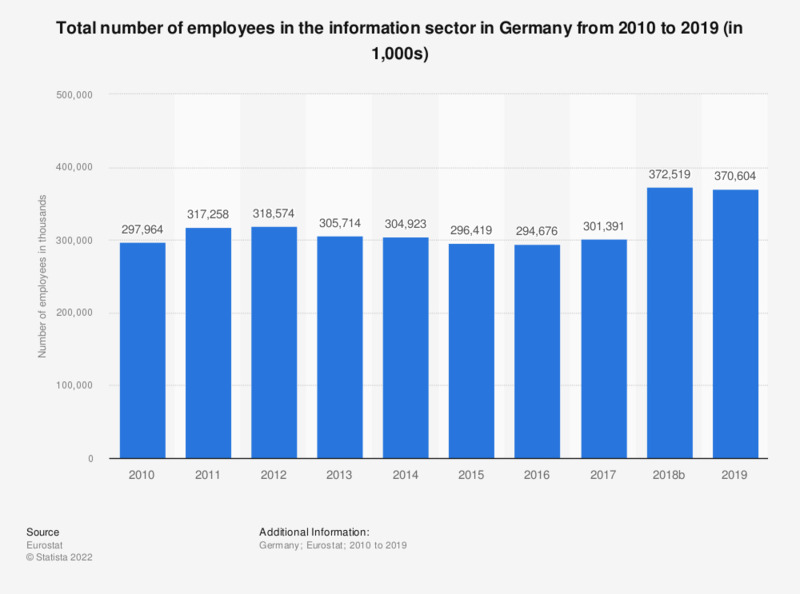 This statistic shows the total number of employees in the information sector in Germany from 2008 to 2015. In 2015, the number of employees decreased compared to the previous year, amounting to a total of 296,419 people. The source adds the following information: "Number of employees is defined as those persons who work for an employer and who have a contract of employment and receive compensation in the form of wages, salaries, fees, gratuities, piecework pay or remuneration in kind. A worker from an employment agency is considered to be an employee of that temporary employment agency and not of the unit (customer) in which they work"
Data coverage corresponds to aggregate INF of NACE Rev 2. Statistics on "IT industry in Germany"
Which are the most important IT trends of 2013? Which are the most important IT trends of 2014?